Coldstream under sink water filter systems contain everything you need to enjoy safe, healthy water straight from a dedicated tap. Coldstream undersink water filter systems are convenient and unobtrusive. The system contains all that is required to enjoy safe, healthy and great tasting water straight from a dedicated filtered water tap. The taps, filter housing and brackets are all made from high quality stainless steel and the kit is supplied with all items – mounting brackets, pipes, valves and fittings, required for a simple and easy installation. The Coldstream under sink water filter system is available with a choice of filters to suit all mains water environments, delivering safe, healthy and great tasting drinking water anywhere in the world. The Coldstream MAX ceramic water purifier provides the ultimate in protection against water pollutants, waterborne viruses and delivers great tasting water too. The Coldstream CTO Plus ceramic water filter allows the essential salts and electrolytes to remain in the water, which leaves it safe and great tasting too. 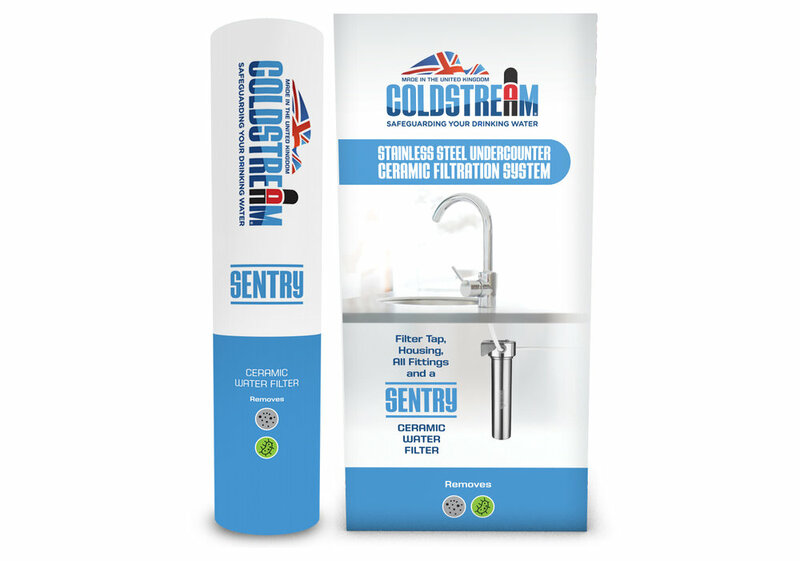 The Coldstream Sentry ceramic water filter provides protection against waterborne bacteria, removing microplastics and particles.